Thanks to social media, our media newsers are now more reachable than ever. 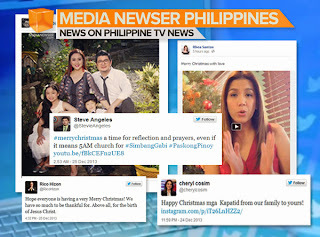 Filipino newsers from our local TV networks and even those who made it to the international broadcast media, all posted their Christmas greetings through their social media channels. Aside from Twitter and Facebook, Instagram also served as a tool for many newsers to extend their holiday greetings and share what they are up to this holiday season. GMA-7's Rhea Santos, for one, posted a video greeting for her more than 100k followers on Facebook using the photo-sharing application. TV5's Cheryl Cosim and ABS-CBN's Julius Babao, meanwhile, posted their greetings along with their family photos taken via Instagram. Hope everyone is having a very Merry Christmas! We have so much to be thankful for. Above all, for the birth of Jesus Christ. “@piaguanio: Merry Christmas everyone! The Lord already gave us the best gift of all. Salvation.”- amen :) merry christmas!